Locally known as “Eagle Cliff”, this architectural showpiece was built in 1895 for San Francisco industrialist, Ernest L. Heuter, who was drawn to the region's similarity to scenic villages of Switzerland. Heuter tapped famed local architect, Harvey Klyce, to create a replica of a Bavarian hunting chalet and upon its completion was used as a weekend lodge to entertain guests from all over the world. Lavish parties among the formal gardens, stone walkways and an outdoor bowling alley became instant classics and the unique nature of the home's architecture helped it grow in stature among Mill Valley tradition. “Eagle Cliff”—What’s in a name? How this rare gem got its name begins with a story of Mr Heuter and some friends camping at the site where the house now stands. One day he shot an eagle there and "Eagle Cliff" was conceived. Once built, the estate was also known as "Heuter's Swiss Chalet" and quickly became an architectural showpiece due to its authentic woodcarving and craftsmanship, tower, cathedral ceilings, and wrap-around balconies. In recent years, the estate was re-constructed to meet the needs of today’s modern living, while respecting and retaining many of the unique characteristics of the original structure. Set on one of Mill Valley's most spectacular parcels of land, this work-of-art features a modern barn-style feel with the same large, open great room of its past, 16 foot kitchen ceilings, and a wall of collapsible folding doors that open to straight-on Mt Tam views and an expansive deck and lawn area. There are 4 bedrooms and 3.5 baths in the main house, with a free standing guest house. 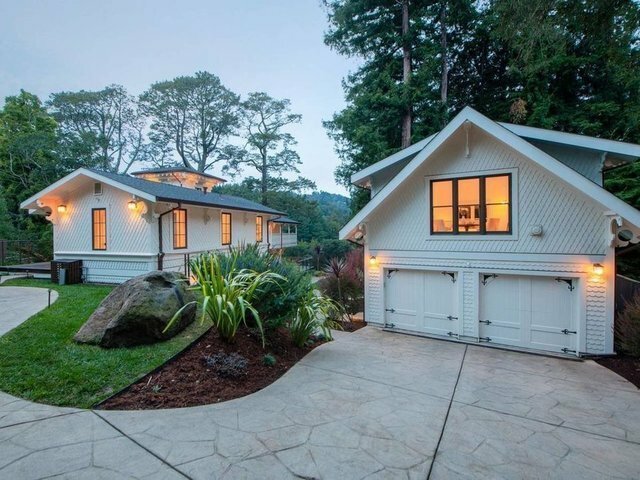 A private pathway winds past redwoods and through the .5+ acre parcel to provide an easy trail to downtown Mill Valley and its vibrant shops and restaurants.